Cauliflower (Gobhi) stuffed parathas, tasty and it’s my favourite. Green chilly (chopped) 2-3 nos. Wash and grate cauliflower, and mix salt in it and keep for 5-10 minutes. Take flour and add enough water (first use the squeezed out one) to make a stiff dough and keep aside for 10 minutes. Now mix green chilli, asafoetida, coriander powder, red chilli powder, amchoor powder, garam masala, coriander leaves together with grated cauliflower. Divide the stuffing into 6 equal parts and keep aside. Roll out one portion of the dough into a 3 inches diameter circle. Spread a little ghee (just one drop) and place a portion of the stuffing and fold the edges of the dough over the stuffing and seal it. Roll Out in the shape of paratha using little dry flour. (It’s your choice whether you want thin or thick parathas). 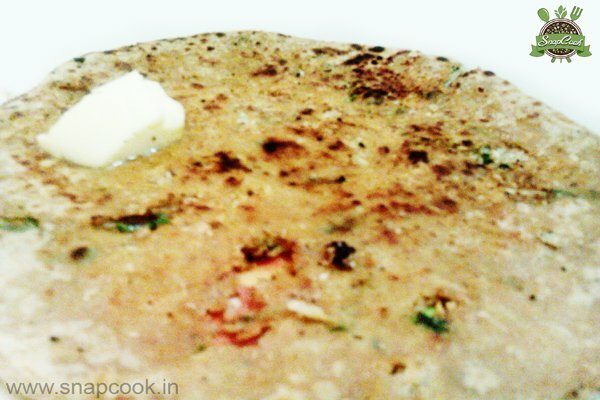 For thin parathas, little take care is required, as filling should not come out. Cook on tava over a medium flame using little ghee/refined/butter till brown spots on both sides. Repeat for the remaining dough and stuffing. Serve hot with curd or chutney or butter. After rolling parathas, put it on tava on medium flame and after1 minute (it’s the time when one side starts changing the colour), turn the paratha. Now again check, if its cooked a little bit, put oil on paratha and cook from both the sides.